The documentary centers around the bold efforts of Okinawa Hands-On to maintain interest in Ryukyu culture, history and in particular language in the face of the relentless march toward modernization and urbanization. At the heart of the program are the interviews in which students, teachers, elders, artists and academics share their contrasting and sometimes controversial views on the need for Uchinanchu to maintain strong ties with their roots via Shimakutuba, their common language. ​Interspersed with the interviews are traditional and historically important Okinawan songs performed in Shimakutuba on stage by the members of Hands-On’s incredibly talented Youth Club. 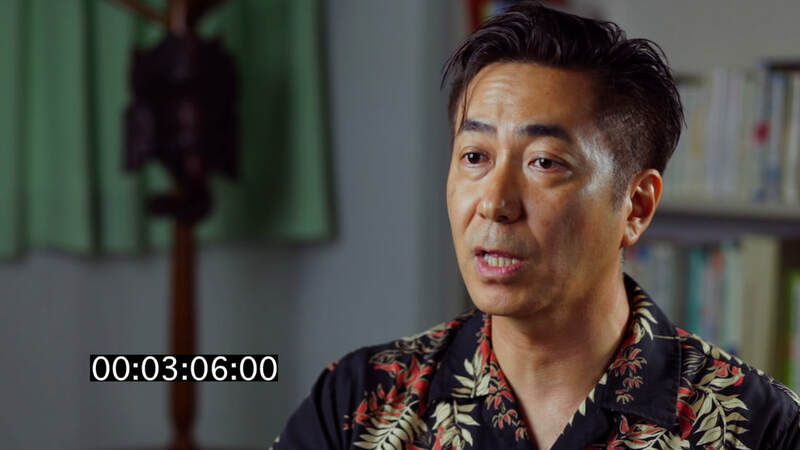 Viewers will come away with a deeper understanding of the plight of Shimakutuba as a living language and the struggle of Okinawans to maintain their unique identity in the midst of Japanese hegemony and bombardment by American pop-culture. Uchinanchu around the world will be inspired to communicate in their native language and reconnect with their roots. Konshuu n shimakutuba documentaru nu naaka kara n-jiiru chunu shoukai sabira. Nama chukutooru documentary nu naaka nkaee watta Hands-On Staff n njitooi biin. shashinoo Hands-On program coordinator mata, shimakutuba geki utootee kantoku chitumitaru Philippine tu Uchinaanchu taachi nu bunkwa nu identity mucchooru Miyazato Jun yaibiin. Karin mata katudou tuuchi identity nu teeshichi sa shitcharu chunu chui. 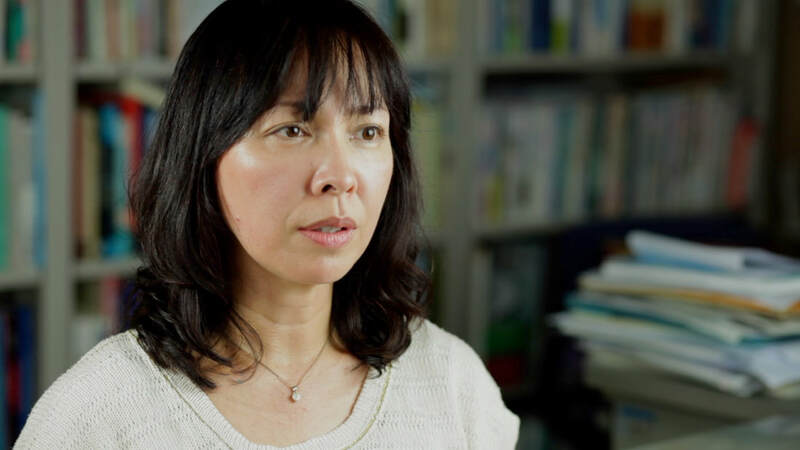 We would like to introduce one of our documentary interviewees, professor Shigehisa Karimata. 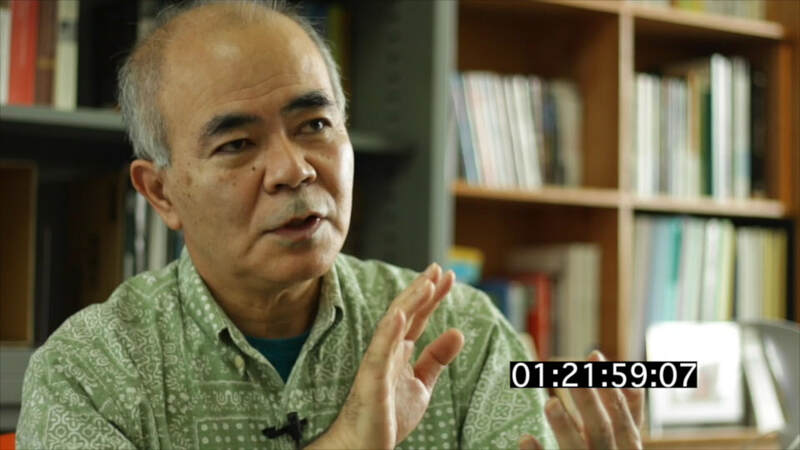 Karimata-sensei talks about “Chimugukuru,” the Okinawan soul, and about some of the challenges associated with preserving Ryukyu languages. 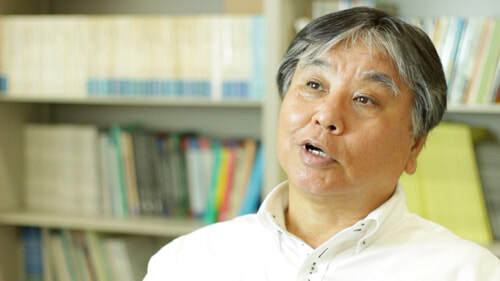 Karimata-sensei explains the importance of protecting minority languages and stresses that we cannot afford to let the minor languages of the Ryukyu islands pass into antiquity. Karimata-sensei, ippee nifwee deebiru! Nama chukutooru Documentary nkai nu shutsuen itadachooru Ryuukyuu Daigaku nu Karimata Shigehisa Kyooju nu shoukwai yaibiin. Karimata shinshii ya nama ushinaari kakitooru uchinaa nu fuujuku, bunka kara uchinaanchu nu chaaga narathicharu chimugukuru, Ryuukyuu shogo hozon keishou-shi ichuru wiinji chimugakai sariishini chiithi ufanashi-shi kwimisoochan. Karimata shinshii ya minority gengo nkai nu tayousei ga ippe-teeshichi n diru kutu iyattooi, chunuchaa ga minority gengo,hougen ni chiithi mukanshin diru kutu nuru shimakutuba ga uturuthi ichuru magisaru mondai nu tiichi ndiru kutu imisoochan. Haisai Everyone! We’d like to give you an update on our documentary. Today we would like to introduce Ms.Tsuyako Shimabukuro, the leader of Deigo Musume, a legendary Okinawan traditional folk music group. 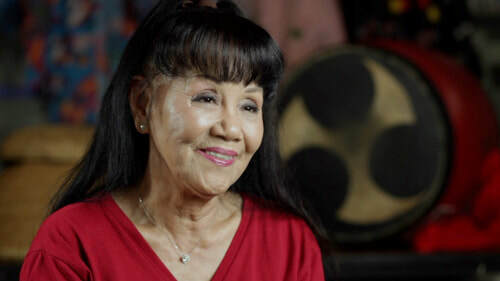 The group is renowned for singing “Kanpou nu Kweenukusaa, which means "people who survived the bombardment in the Battle of Okinawa.” Ms.Tsuyako Shimabukuro also plays an important role in demonstrating leadership as the chief of a ward and encourages every person in her community of Chatan Town Eguchi Ward to become involved. In her interview, she gets to the core of the importance of Okinawan local dialects of Shimakutuba. Haisai Gusuuyoo, Chuu wuganabira. Kunkeen watta Okinawa Hands-On ga seisaku so-ru documentary nu shinchoku un nuki yabira. Uchinaa ikusa atunu chunu ichizama tu ichimabui nu ariyoo ippe-kumirattoru uta uchinaa daihyou suru Deigo Musume san nu fumetsu nu minyoo kyoku "Kanpoo nu kweenukusaa." unu Deigo musume san nu kajitui sooru Shimabukuro Tsuyako-san goshoukai sabira. Wattaga sonkei sooru Shimabukuro Tsuyako sanoo utanu kajitui bikeeya aibiran, Chatan-cho Eguchiku nu jichikwaichou tushi Chuishiijii nu yenishi hirugiru katudoun sooibiin. Nama chukutooru documentary nu hanashi nu tuikee nu naaka uti Okinawa Christian University nu Arakaki Tomoko Shinshii ya, shimakutuba nu inshou nu chanugutu shi kawati, mata namanu shimakutuba nu chigatooru mikata keeti unu kachi wakairu kutu nu teeshichi sani chiiti katati kwimi sheebitan. Haisai everyone! We interviewed an energetic fisherman in Yomitan, Mr.Susumu Fukuji. He speaks Tokeshi Kutuba in Yomitan, which was passed on from his parents. He tells us about the importance of communication using proper language in different situations and gives a message to the next generation. 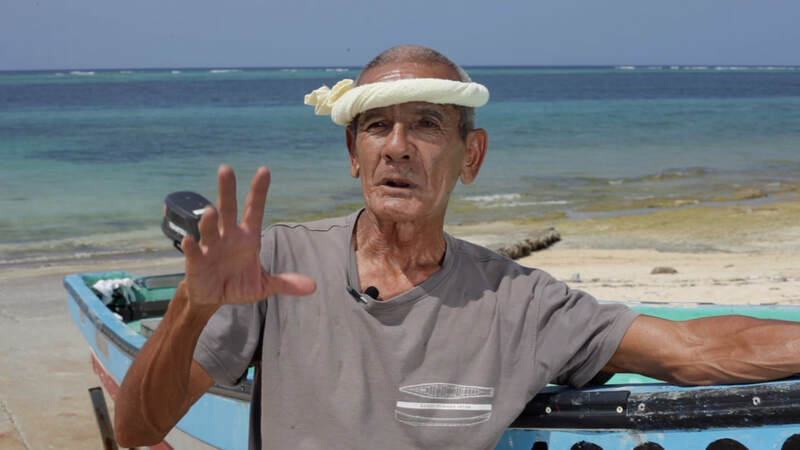 He uses Shimakutuba with other fishermen and says it is easier for them to communicate in Shimakutuba with each other. We would like to introduce our editor for the documentary. Ryubu Akamine is in charge of editing. He is also a leader of the Hands-On Youth Club, whom you will see in the documentary. Ryubu is a very passionate man and embodies the warm “chimugukuru” heart and spirit of Uchinaa. We would like to introduce a scene in our documentary. In front of the grave of Shiromichu,Tuba Kacchin teaches the youth club members about the importance of the creator gods and goddess in Okinawan folklore and cultural history.